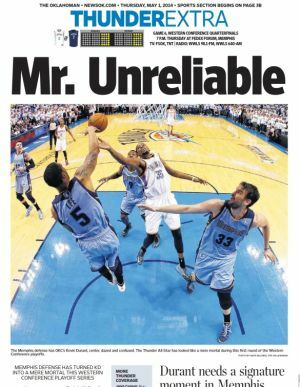 Oklahoma Newspaper that Trashed Kevin Durant Apologizes … Finally. ICYMI: The NBA Playoffs are in full swing. Teams are leaving it all on the court and sports reporters are becoming huge homers for the local team. Well, most of them. The sports world blew a gasket. “Unjustified,” “Shameful,” and “Smoking crack” were a few of the sentiments out there. Durant didn’t blame them because he’s more of a gentleman — and about to be a free agent. So, he goes out the next night scoring 36 points and leading the team to victory and a Game 7. After a day hearing the news world still blowing up the paper, that’s when the paper apologized. Sure, Kevin Durant wasn’t playing his usual half-man, half-amazing self during the first round against the Memphis Grizzlies. However, any team in the NBA would sell its owner to get their grubs on him. Yet, there’s the sports department for The Oklahoman crying a spoiled brat routine. You know, like when the Yankees go five years without a World Series. The nerve of that team, right? And so, the sports editor for the state paper admitted to #HeadlineFail in this excerpt from NBA / Sports Illustrated. Ya’ think? How did that headline even make it through the … oh, what’s that title again … um, it’s on the tip of my tongue … oh yeah, the sports editor’s desk is beyond me. But hey, good looking out apologizing after you get clowned on national TV by your ilk and KD himself.